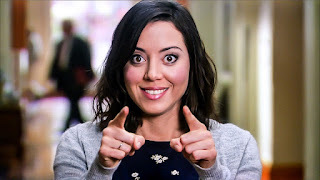 If the spicy, fiery* Latina is the stereotype equivalent of a trashcan fire, April Ludgate-Dwyer is the smothering fire extinguisher foam putting it out. And I can say that because we all this is a metaphor April herself would love. As we've been discussing on this month's look at the representation of Hispanic/Latinx characters in pop culture, Hispanic/Latina women are faced with a lot of frustrating, racist stereotypes out there in the world. Our televisions and movie screens overflow with oversexualized "mamacita" tropes while nuanced, fleshed out, complicated Latina characters rarely get to exist outside of indie cinema and TV stations where Hispanic audiences are the target (and largely only) audience. So to break up all this infantalizing, insulting garbage frequently thrown at the Hispanic/Latinx community, this month we've been talking about characters who disrupt that narrative. The weird ones, the outliers, the male and female characters who push back against respectability politics, tired stereotypes, and hackneyed tropes. For Strong Female Character Friday we've looked at Isabelle Lightwood on Shadowhunters, a brilliant forensic scientist born into a long line of demonhunters, and America Chavez from Marvel's Comic Universe, an extradimensional superhero who happens to be queer, complicated, and unapologetic about her heritage or her sexuality. 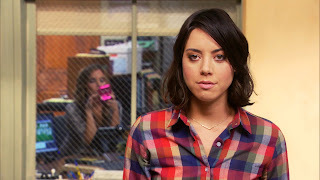 Today is the next chapter where we talk about April Ludgate-Dwyer, a weirdass weirdo who bites back at the idea of Latina femininity as one monolithic thing, and frequently just plain bites people literally. She's awesome. April Ludgate-Dwyer (played by Aubrey Plaza) is the kind of character you can hardly believe exists when someone describes her to you. She has to be seen to be believed. Originally a relatively minor character in the first season of Parks and Recreation, the criminally underrated masterpiece sitcom about really really passionate people in local government, April rises to prominence throughout the second season, becoming by even the third season a competent foil for main character Leslie Knope (Amy Poehler) as well as one of the main hearts of the show. While it would be easy to attribute this rise to April's slowburn (and then really short fuse) romance with the shoeshine guy, Andy (Chris Pratt, both before and after he got super famous), it's more accurate to say that while Andy was falling in love with April we were too. For a character who loves to talk about how much she wanted all her coworkers to die in a fire, April turns out to be a singularly compassionate friend and a fantastic person. Most of the time. But the show doesn't give us April's character development by stifling her weirdest tendencies and having her end up with the cookiecutter life she so despises. Instead, Parks and Recreation commits to April's personality and history, bringing us a woman who can grow into maturity while still being the kind of person who puts on zombie makeup right before she goes into labor for the aesthetic. Here's the deal: originally a lowly intern in the Parks Department of Pawnee, Indiana, April starts the show utterly disaffected and disinterested in the world around her. She has this internship because she needs it for college credit, and she needs the college credit because she's going to the local community college...mostly to get out of the house it seems. April is a character going nowhere fast and she doesn't seem all that bothered by this. And then something happens. Either the writing shifts or the light changes, and suddenly April has a couple of ambitions, small though they might be. First she gets a crush on Andy, which is hilarious to watch because it's like watching a really angry cat decide whether or not to maim a puppy, but really gives us an insight into her character. April might be misanthropic and sometimes cruel, but she really likes Andy, who is anything but. The question then becomes, Why? The storyline could easily have fallen into boring territory there as April's earliest plots all center around her will they, won't they relationship with Andy, but the faint confusion of why precisely April likes him anyway keeps us grounded. Andy is the inspiration for April to get a full time job at City Hall (acting as Ron Swanson's assistant with the promise that she will be so grossly incompetent and hostile that he'll never have actually do government work), but he's never the sole reason we care about her. More, it's because we see this new, soft, earnest side of her in her pursuit of him (and believe me, she is the one doing the pursuing) that we come to realize how many dimensions April really has. By season three, they're dating (it's not spoilers if it happens less than halfway through the show) and by episode ten of season three, they're married. April and Andy tie the knot in a hilarious moment of "screw it, we're young and in love and whatever", tricking all of their friends and family into coming to a fancy dinner party that turns into their wedding. While this episode is pure comic genius, particularly with Leslie and Ron (Rick Offerman) debating whether or not to let April and Andy go through with it, the real beauty of it is that it settles the question of their relationship once and for all. April and Andy get married, and then their relationship becomes the bedrock of the show, the most stable and functional marriage we see, a union of two people who are utterly bizarre but adore each others' weirdness. Really, though, getting the wedding out of the way early actually means that the writers have room to explore April as a character without having to make all her plots revolve around whether or not she and Andy will get together. And because Andy acts as the little softening agent to remind us that April might love zombies and blood and videos of people being tripped but she also loves an earnest, simple man too, we never lose sight of the secret softness inside of April. Which makes her all the more compelling to watch. No, instead of being a traditional sitcom love story, April's arc on Parks and Recreation is really about identity and growing up. For a woman who wants to rebel against society's expectations and the box she's put in, April has a hard time figuring out how she can be a responsible grownup and also the freak she knows she is inside. That's a struggle I totally get. And it's also a struggle that we rarely see female characters of color, or characters of color in general, facing. The seasons of Parks and Rec, though they focus on other characters more and really do follow Leslie Knope's rise in local and eventually national government, are also about April Ludgate-Dwyer growing up. She goes from intern to reluctant assistant, and when Leslie has to take a leave of absence to run for city council, April is the one stepping up to fill her role as Deputy Director of the Parks department. In season five, she becomes the Deputy Director of Animal Control, and when Leslie gets promoted to the National Parks Service in season six, she takes April with her. April might hate her job and people and everything, but she's also very good at it. More importantly, however, her slow and steady rise gives us a picture of Latina success that's oddly unusual onscreen: the woman who works hard and does a good job and gets promoted at an even and appropriate rate. I hate how unusual that concept is, but it's true. April's rise is anything but meteoric, and yet she also doesn't struggle against storylines about how she keeps nobly striving and yet no one will ever give her a chance. I'm not saying that we can't or shouldn't have narratives about sexism and racism in the workplace, I'm just saying that it's oddly refreshing to have a character of color whose biggest problem at work is that she doesn't really like her job and has to do it anyway. I'm getting off topic. The real story of April through the seasons isn't about Andy or her job, interesting as those storylines may be. Instead, it's about her coming into her own identity, becoming the woman she was meant to be, and realizing that she can be kind and weird and responsible all at the same time. April Ludgate-Dwyer is, by the end of the series, the kind of woman you desperately want in your corner. Yes, she will talk extensively about the different kinds of fake blood and yes she will send you a Christmas card with a picture of a dumpster on it, but she'll also fly across the country to surprise you. She'll adopt thirty dogs when the animal shelter closes because she can't bear the idea of them being sent to a kill shelter or put back on the street. She'll earnestly and honestly express her feelings of respect and love, even if she refuses to make eye contact while she does it. April's story is about a woman realizing that she's been defining herself by surface weirdness: by the obscure bands she likes and how she eats out of frisbees not bowls and hating everyone. It's about her looking at that and slowly, over time, replacing that surface level stuff with genuine depth of character. Sure she's still a deeply weird person, but she's less concerned with if everyone can tell just by looking at her. She's more concerned with whether or not she likes her life, and whether or not the people she loves are happy. And that's a really admirable message to send. Look, at the end of the day, Parks and Recreation is an earnest show about the value of earnestness and public service and working hard and demanding respect and respecting others. It is, when you think about it, a deeply dorky show, and it shouldn't come as any surprise that the character who most resists this call to sincere dorkitude at the beginning has been completely won over by the end. So. How does all of this relate to representations of Hispanic/Latina femininity? Well I hope that some of it is self-explanatory. April is established as a Latina woman from the very beginning, fully cognizant of that part of her identity and definitely comfortable with it (at one point she even goes to Venezuela and comes back with a boyfriend who only speaks Spanish). But she's also a goth weirdo, which is a personality type and character concept that the mainstream media rarely even considers as a possible intersection with Latina femininity, let alone a hilarious one. If anything, what April gives us in terms of feminine representation for Hispanic/Latina characters is the right to be weird. The right to be whoever you are utterly without shame or regret. Actually, the right to rub it in people's faces and smirk as they look uncomfortable. April is a fully developed, complex, fantastically human character. Her racial background is part of her story, but it's also not the sum total of her background or her future. She tells us that it's okay to love your heritage and it's okay not to fit in and it's okay to push back against what people expect. And as far as stereotype busting goes, like I said in the first paragraph, April is a wet blanket on top of all those "spicy", "fiery" Latina tropes. She is sardonic, disaffected, and dispassionate. She loves her husband in an open and emotional way, but is never sexualized or even shown in any particular amount of undress. She is shown to be incredibly intelligent, but also never forced to be a respectable, proper young woman. April pushes back by just being herself, and it's exactly enough. 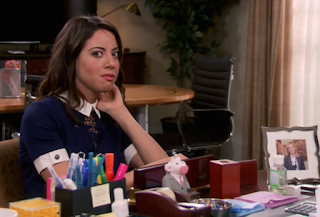 I think it's too easy to say that we should just make every character like April Ludgate-Dwyer. That wouldn't, in the end, be a pushback against Hispanic/Latinx stereotypes so much as an oversaturation of sarcastic, deadpan snarkers. But I do think that April is an instructive lesson to writers and developers in the television and film industries. If we learn anything from her, it's that we shouldn't be afraid of characters who sound too "out there" on paper. Instead, we should let characters just be whoever they are. *So apparently I have been spelling this word as "firey" my entire life and that is wrong. Whoops. As a professional proofreader, I should probably be deeply ashamed of this, but mostly I'm impressed at my own mental fortitude for assuming everyone else was wrong for almost thirty years. Well, this is definitely awesome! Thank you for this. I want to say that i gave a lot of homework to do today and i need help with my writing. I see that you are great in it.